Getting your baby to sleep can be a challenge. Everyone knows that you shouldn't wake a sleeping baby – in theory, that is. Ideally, you want to be able to take them anywhere without disturbing their sleep patterns. That's why a travel system is ideal for newborns and babies. You'll have the convenience of car seat and stroller without disturbing the baby. Let's take a look at the best travel stroller. A travel system is a stroller that comes with a car seat and a base that is installed in your car. This way, you can click your baby out of the vehicle and attach the car seat to the stroller without disturbing them if they're asleep. There are some travel system strollers out there that are available in different price ranges. Let's check out what to look for when considering a travel stroller. Heather Corley of The Spruce strongly recommends focusing on the car seat when choosing a travel system stroller. While strollers can range in comfortability, the safety of the car seat is paramount. Narrow down your search by choosing travel strollers with a car seat that fits tightly into your car. The car seat should also be easy to install in both your car and the stroller. When transferring a sleeping newborn, you don't want to create too much hassle. Travel strollers come in all shapes and sizes. It's good to consider the size of your vehicle against the size of the stroller. You don't want to buy it before realizing that it won't fit in your car. It can be hard to stick to a budget when it comes to babies. Unexpected things pop up, and you find yourself stretched more often than not. Baby List recommends the Chicco Bravo Trio Travel System. It features all the perks of a travel system stroller combo without the expensive price tag. What's more, it's easy to assemble and install. It even has leveling mechanisms on the car seat to indicate when it's correctly positioned. Some additional features include cup holders – essential for bringing along your morning fix – and a tray to hold your phone and keys. It comes with every convenience of a full travel stroller system, without being bulky and awkward to maneuver. Once it's folded, it will stand on its own. This is great if you're planning on storing it upright and don't want something that's going to take up too much space. This travel stroller will accommodate your child in the car seat right up until their first birthday. Anna Lane of The Bump puts Britax B-Free stroller travel system at the top of the list. She explains that not only does it have a great car seat, but it's a great stroller as well. With three wheels, this stroller offers a smooth and sturdy ride. It features a one-hand fold which makes it extremely easy to dismantle. The stroller seat itself can fully recline which gives you another option for your sleeping newborn. It comes with several storage pockets and a canopy in case it rains. Its handlebar is adjustable which enables you to create a stroller system based on your personal preferences. One of the best parts of the Britax B-Free stroller travel system is the car seat. While it comes with a safe and reliable car seat that will fit effortlessly into your car, it is also compatible with any other infant seat on the market. There are many things that make it on the to-do list when having a baby. One of these is deciding how to take your baby on walks without disturbing their sleep. 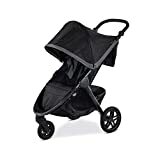 Investing in a travel system stroller combo is the perfect way to keep walking post-partum while ensuring your baby is comfortable. Two clicks are all it takes to put your baby in the travel stroller.